EVE Online studio CCP wants to make December 9 the most interesting day in the history of New Eden. The Museum of Modern Art chose EVE Online as one of 14 games that will go on display in one format or another in a videogame exhibit that premieres on March 2013, and now CCP has revealed how it intends to present its infamous space-based MMO to the world of art lovers: a full day of life in New Eden distilled into a brief video sequence that will be shown across two large screens. 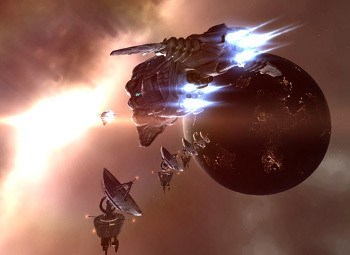 "Rather than having a PC simply running EVE somewhere in the corner with a keyboard and mouse and risk the untrained audience spending their time angrily trying to open the door in the captain's quarters or being serial suicide ganked in Jita, we decided on a more linear presentation," CCP t0rfifrans explained. "So we call on you. Let's make Sunday, December 9th the most interesting day in the history of New Eden and capture it to be archived forever in the nuclear-apocalypse-proof vaults of the MoMA." "Our infographics will display market activity, NPC kills, player kills, jumps and all those metrics that explain how vibrant and alive our world is," he wrote. "The player captured gameplay videos will give it a human face. Whatever you are doing that night, whether it is running plexes, hauling ore, hunting with a small gang in losec, or fighting in a large fleet engagement, we ask that you record it, both video and sound and chatter, upload it and allow us to celebrate it in a montage of New Eden awesomeness." There are rules, of course. Anything that violates the EULA won't be used, nor will "blatant obscenity or other behavior which may be entertaining to you, but doesn't necessarily help paint this image of the universe of New Eden we want to communicate." How that squares with the notoriously bad behavior of EVE players - which, I think we can all agree, is what results in the game's most interesting days - is left unsaid. Instructions for recording and submitting your contribution to "the most interesting day in New Eden," as well as further guidelines about what CCP is and isn't looking for, can be found at the EVE Online Dev Blog.